The Basilica di San Vitale is one of the most important and beautiful architectural monuments in all of Italy and should on no account be missed if you are anywhere nearby. The Basilica, a classic Byzantine structure, was built on the site of the martyrdom of St Vitalis, a Roman slave and an early Christian Martyr, and was consecrated in 547 AD by Archbishop Massimiano. The church is designed as a double octagonal shell with a domed octagonal core and is one of the finest examples of early Christian Byzantine architecture in Western Europe. 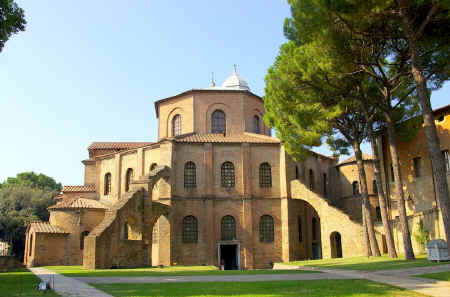 It is one of eight structures in Ravenna on the UNESCO World Heritage List and the only major church to have survived almost intact from the reign of Justinian until today. The architecture of the church is thought to echo the design of the Byzantine Imperial Audience Chamber, the Chrysotriklinos, of the Great Palace of Constantinople, of which nothing remains standing today. The brick austerity of the outside walls of the Basilica conceals the spiritual mystery of the interior, where the visitor is greeted with a luminous radiance created by the light entering through the windows in the ambulatories, galleries and dome. Roman influence can be seen in the dome, the shape of the doorways and stepped towers, while the Byzantine elements are apparent in the narrow bricks, the capitals and polygonal apse. San Vitale is most famous for its mosaics, which are the largest and best preserved Byzantine mosaics to be found anywhere outside of Constantinople. In the lunettes above the tryforia there is a series of mosaics depicting scenes from the Old Testament, including the stories of Abraham and Melchizedek, Abel and Cain, Moses and the Burning Bush and Jeremiah and Isaiah, representing the twelve tribes of Israel. Each lunette is crowned with an angel holding a medallion adorned with a cross. In the corners, by the mullioned windows, are the mosaic representations of the four Evangelists with their respective symbols, the angel, the lion, the ox and the eagle. Perhaps the two most famous mosaics, executed in 547, are those which can be seen at the foot of the side walls of the apse. On the right is the mosaic depicting Justinian I, attired in Tyrian purple and shown with a golden halo. Around him are the members of the court and of the clergy and by his side Bishop Maximian. 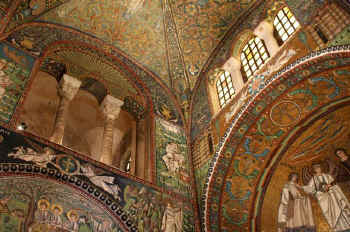 On the other side of the apse can be seen the mosaic featuring the wife of Justinian, Theodora. Resplendent with golden halo, jewels and crown, she is accompanied by her court ladies. Represented almost as a goddess, on the hem of her robe can be seen the depiction of the Magi. 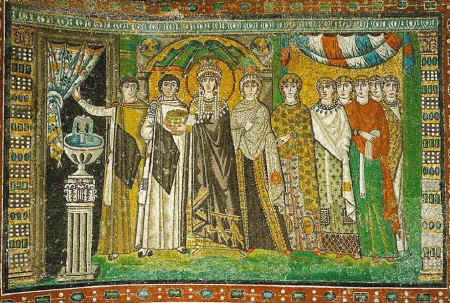 Although by virtue of being a woman, Theodora would have been barred from the sanctuary, whether as a suppliant or the bearer of an offering, her presence in the mosaic is visually powerful and compelling. How was the Basilica financed? The Basilica very likely had several sponsors. One of these was a Greek banker, Julius Argentarius, about whom very little is known. 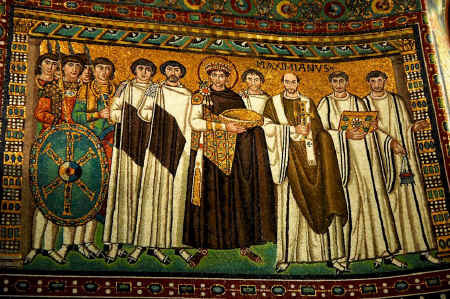 Some believe that he is the man depicted as standing between the emperor and the Bishop Maximian in the Justinian panel. There is evidence that the land upon which the Basilica is built was donated by the imperial treasury in the inventory of which is was listed, and the lavish construction lends itself to the probability that the construction was funded by the imperial purse. As the Emperor Justinian and his wife, Theodora, had received considerable criticism for their extravagant building programme, it is not unreasonable to suppose that the mysterious banker was in fact an agent acting on their behalf and through whom the funds were channeled. The name Argentarius implies this to be the case, as this was the term used in Roman times for a banker who acted as a middleman in fiscal matters. 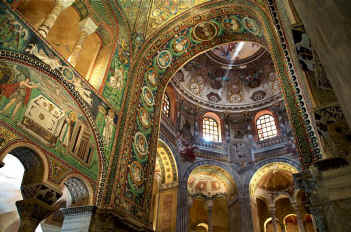 The Basilica is located in the centre of Ravenna, in the Via San Vitale. Visitors touring the north of Italy can reach Ravenna from the A14, turning off the A14 and approaching the city centre through Casermone San Bartolo and Lugo-Cotignola. This route will take you directly down to the SS16, where you turn right on to the Via Classicana, before turning left on to the Via Faentina. The Via Faentina then joins the Via Maggiore, where it would be best to find parking and then walk the few remaining streets to the Basilica. Walk straight ahead, crossing the Circonvallazione San Gaetanino and the Via Don Giovanni Minzoni. Continue straight on until you reach the left hand turn for Via San Vitale. Bus route no. 1 will take you to the Basilica, stopping 200 m away from the entrance in the Piazza Baracca. For those visiting Ravenna for the day from a cruise around the Med, leave the cruise terminal for the car ferry to cross the water, and then catch the no. 70 bus into the centre of Ravenna. With a map obtainable from the tourist office in Via Salara, you will easily be able to find the Basilica. The basilica is open from: 9.00 am to 5.30 pm during March; from 9.00 am to 7.00 pm through April to September; and 9.00 am to 5.30 pm in October, with last admittance 15 minutes before closing time. Ravenna © ammonet InfoTech 2008 - 2018. All rights reserved.